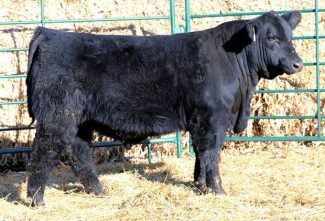 A half interest in the high Selling Chi bull went for $20,000 to Brandon Rock, Long Valley, South Dakota. Location: Aberdeen Livestock, Aberdeen, S.D. Steve, Barb and Tyler Melroe of Gwinner, North Dakota, Jeremy and Bethany Lehrman of Spencer, South Dakota, with guest consignors Jordan and Amanda Holt, Mina, South Dakota, again brought an impressive set of cattle to town. The sale average was up, thanks to great activity from bidders who have bought these performance cattle in the past. These families work hard to improve their genetics every year and bring a better product year after year. Clearly the Melroes' neighbors like the Chi influence they have become accustomed to in those cattle. Repeat buyers see the benefit of using the proven genetics when they sell on the grid. Some customers feed their own calves and have found great success there too. Lot 10, $20,000 for half interest, half possession, sold to Brandon Rock, Long Valley, South Dakota. was one of the elite Chi bulls at this sale and boasted an ADG 4.5. This 20 percent Chi, polled bull is going to a good program. Lot 5, $12,000, to Pearson Cattle Company Wick City, South Dakota. This 20 percent Chi, polled bull boasted an ADG of 4.7 pounds, and a WW of 785 pounds. The Momentum son out of a Woodhill Foresight daughter was another attractive, clean made, muscular individual. Lot 4, $21,000, sold to NLC Simmentals, Wessington, South Dakota. This son of Remington Lock and Load out of an R and R Wearhouse Daugther was born at 81 pounds and weaned off at 816. The Black, polled, purebred bull weighed 1,572 pounds at a year and was one of the real good purebred Simmental bulls we will sell this year. Lot 39, $10,000, sold to Jordan Krueger, Spencer, South Dakota. This Lock and Load son out of a Conneally Forefront daughter is half Simmental, half Angus, black and polled. The ET calf posted an 83 pound BW, 878 pound WW and, 1,746 pound yearling weight, along with an ADG of 5.5. Lot 64, the high selling open heifer was consigned by Holt Cattle Co. This HDSC Mr. Ace daughter out of a Northern Improvement cow sold to Duerre Farms, Bristol, South Dakota. If you like sour cream raisin bars, be sure you add this sale to your schedule for next year. They are fabulous!